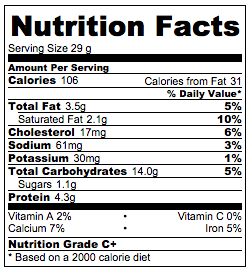 I may not know much about football, but I know how the fans love to eat! 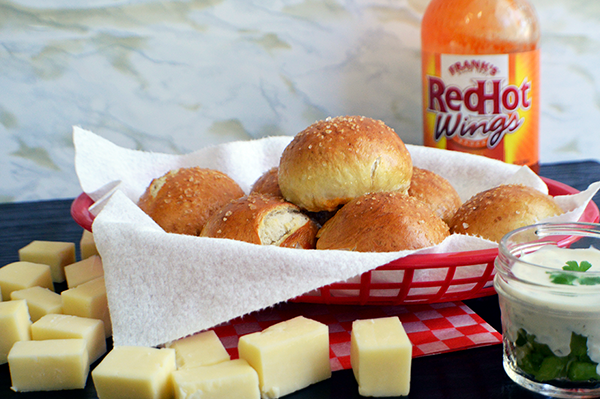 Tailgating has always been my favorite part of football games anyways - and with these cheese stuffed pretzels, you are bound to score a touchdown with both sides of the field. 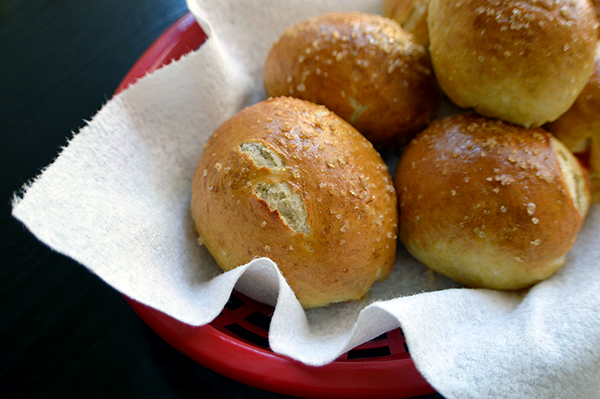 Had I known how easy it is to make pretzels, I would have started making these things years ago. The secret is not in the dough, but the baking process itself. 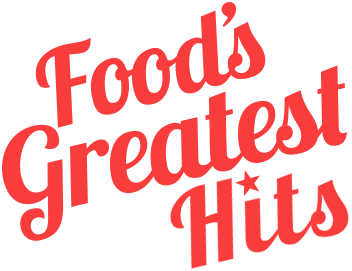 The dough itself is made from yeast, flour, sugar and water. I stuffed half of mine with pepper jack cheese and the other half with sharp cheddar and a touch of buffalo sauce. Begin by making a simple dough by first dissolving the yeast in warm sugar water until frothy. Then slowly add the flour to the yeast until a sticky ball forms. Continue adding the flour until the dough reaches a tacky consistency. 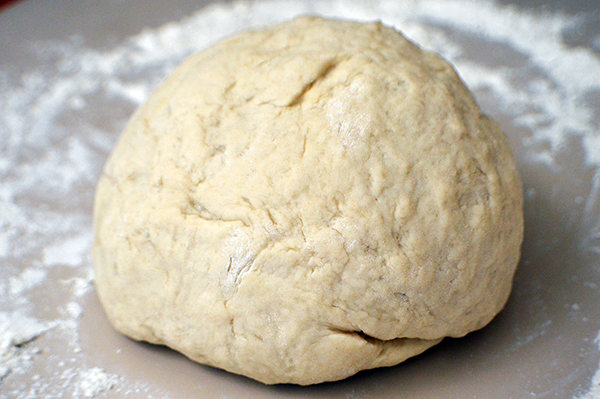 Roll the dough out on a floured surface until it forms a smooth ball of dough. Split the dough in half, then into quarters, and repeat splitting the dough until you have twenty four evenly sized dough balls. 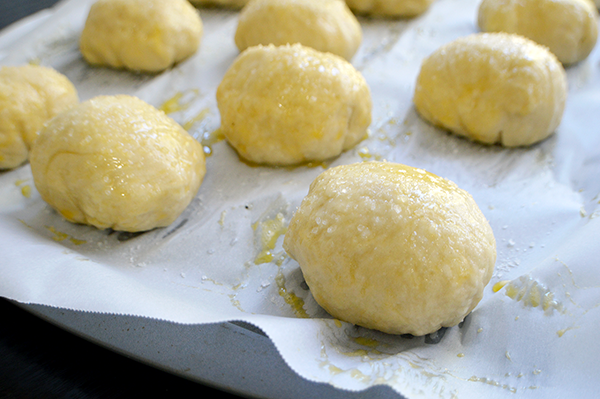 Flatten each dough ball and place a piece of cheese in the center. I chose to make half of my pretzels pepper jack and half buffalo cheddar. For the buffalo cheddar ones, I added about an eighth of a teaspoon of buffalo sauce into the center of the flattened dough, then folded the dough around the cheese. It's important not to add too much buffalo sauce into the center since the sauce will create steam and pop the pretzel while cooking. While preparing the pretzels, bring a pot of water to a boil on the stove then add the baking soda to the water. This is the secret step to achieving that gorgeous, shiny brown skin that pretzels are known for. Boil the pretzel balls for thirty seconds to a minute then arrange the boiled balls on a baking sheet lined with parchment paper. 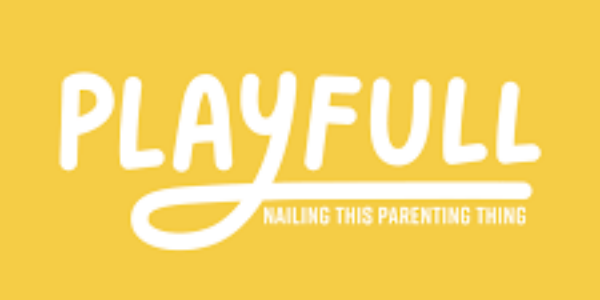 Brush the tops of each ball with egg then generously crack coarse salt onto the top of each one. Bake the pretzels at 450 F for 10-15 minutes, or until the pretzels are golden brown. Don't worry if some of your pretzels popped open while baking. Anything stuffed with something that creates steam has a chance of splitting somewhere! I served my pretzel bites with some chopped celery and ranch dip. Heat one and a quarter cups of water to 110 F. Stir the sugar into the warm water until dissolved then add the yeast packet. Let the yeast activate for 5-10 minutes, or until frothy. Add the yeast water into the bowl of a stand mixer. Slowly add the flour, a fourth cup at a time until a sticky dough forms. 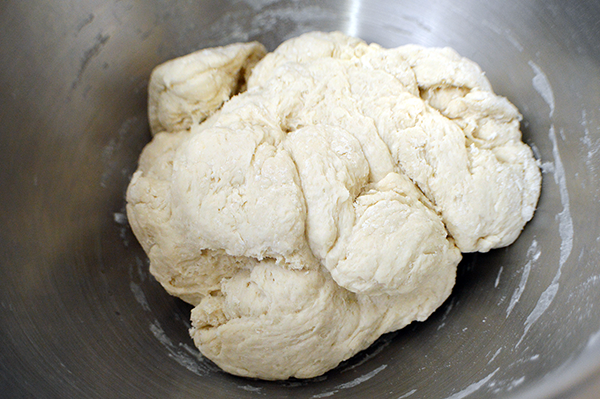 When the dough reaches a tacky consistency, roll the dough out onto a floured surface. Knead the dough until smooth. 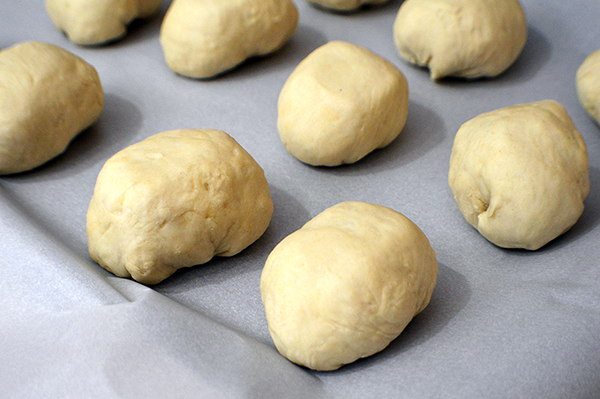 Split the dough into 24 evenly sized balls. 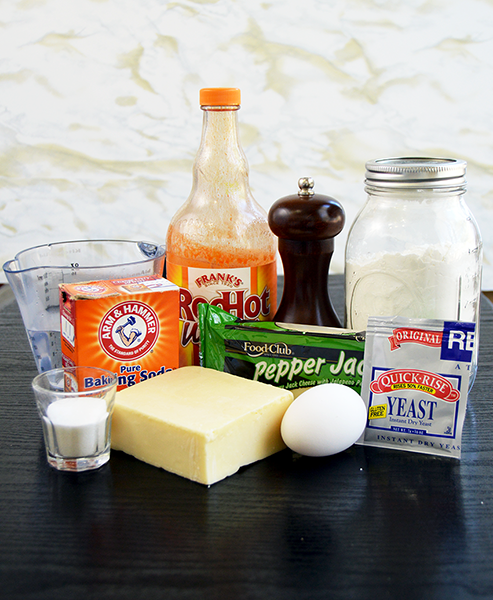 Flatten each and add a cube of cheese and 1/8 teaspoon of buffalo sauce in the center. 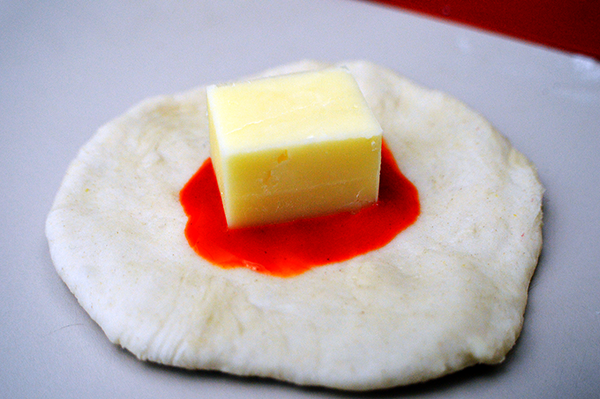 Wrap the dough around the cheese and seal the edges. Preheat the oven to 450 F. Bring a pot of water to a boil. Add the baking soda to the water and stir until it is dissolved. WARNING: Baking soda will cause the water to fizz slightly when added. 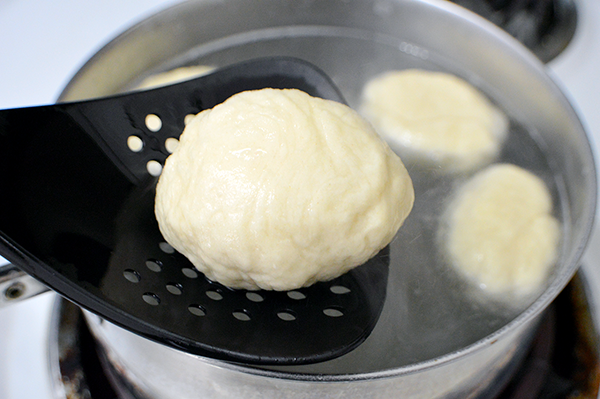 Drop the dough balls into the water in batches of three. Boil for thirty seconds to one minute. Remove the balls from the water with a slotted spoon, then arrange the dough balls on a baking sheet lined with parchment paper. 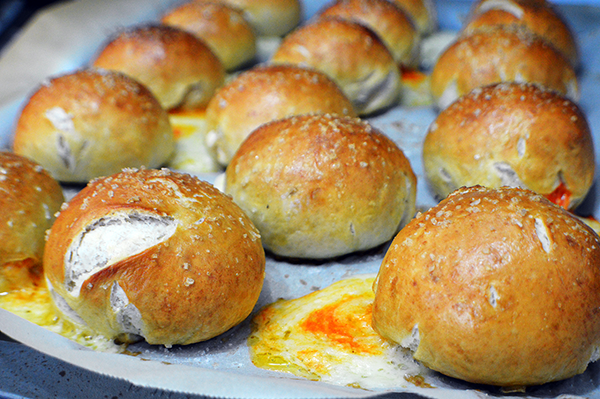 Brush the egg onto the top of each dough ball. Sprinkle coarse salt onto the tops. Place the pretzels into the oven and bake for 8-10 minutes, or until golden brown and shiny. Serve hot and enjoy! Go Football Team!